People often ask, what all does my role as a product owner entail? I tell them, my role entails everything that it takes to increase the customer base and product revenue. It includes, but is not limited to, understanding the customer requirements; analyzing the industry trends; keeping the product quality in check, shipping the right product at the right time, and gathering the feedback from the customer to help improve the product quality. Product management in a DevOps world is extremely fast-paced: the product has to be delivered fast, the feedback has to be addressed quickly, and the customer support should be instantaneous. But thanks to the inherent transparency that DevOps brings to the delivery ecosystem, it is possible to accomplish these tasks. Further in this blog, we will discuss in detail how product management has evolved in the unified DevOps setup and why despite challenges most Product Owners love the DevOps setup. As speed of delivery is one primary factor for success today, unlike pre-DevOps era, the product owners, today, can’t wait for months to gather the real customer feedback or work with an inflexible pre-defined product roadmap for the entire year. In a DevOps setup, the customer feedback keeps coming through the integrated sales and IT Service Management (ITSM) systems and must be tapped in the real time. The product roadmap in a DevOps setup is dynamic – the execution of changes happens on the fly, while keeping everyone in loop. Customers today are not ready to wait for years to see meaningful action on their feedback; in fact, they are often not ready to wait for a month. Therefore, the real deal breaker now is the speed and quality of support that a customer receives when they encounter an issue or when they are getting acquainted with a new product or feature. Apart from soliciting feedback from the customers and helping the organization define the product messaging and go-to-market strategy, the product owner and the product management team in a DevOps setup also works with support teams to analyze the customer feedback. A product owner acts as a bridge between the customer and teams within the organization to make a phenomenal product and also ensure that the product delivery is faster and efficient. However, to bring all these stakeholders on the same page is a daunting task in the fast-paced DevOps world. At the core of these challenges is the lack coordination between the internal teams and absence of complete context about customer and internal data at all times. Therefore, it is necessary to create a transparent work environment where all teams and stakeholders have access to requisite data in real time. But how should one go about creating a highly collaborative and transparent work environment? Some organizations choose a single Application Lifecycle Management (ALM) system over multiple systems to enhance collaboration. More often than not, the chosen ALM system provides the much-required collaboration, but takes away the functional richness of the ecosystem. The teams also don’t feel comfortable working with a system that doesn’t completely meet their needs and is not best for their role. The best way to go about integrating an ecosystem, therefore, is to use out-of-box integration solution that helps seamlessly connect multiple types of systems in the delivery ecosystem. By integrating the best-of-breed systems, one can retain the functional richness of the ecosystem as well as achieve collaboration, which is the key to a successful DevOps setup. In a setup like this, a product owner has visibility not only into internal operations, but also into the customer feedback in real time. This helps the product owner in taking reliable decisions, faster and provide better service to the customers, always. 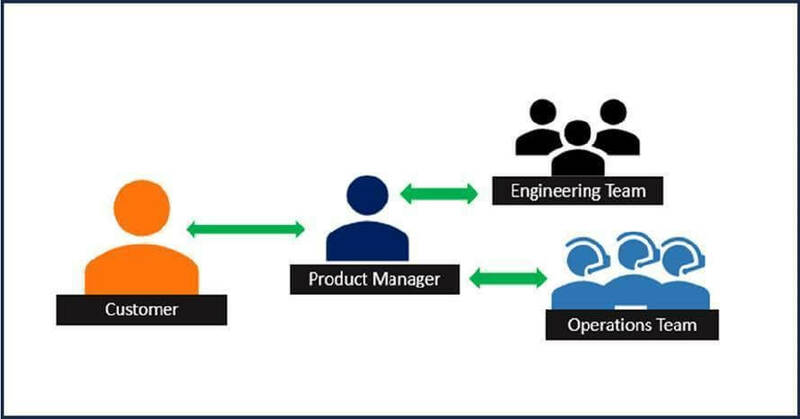 Product management is no longer a siloed role, especially in a DevOps world. It requires close collaboration with other functions and constant contact with the customer. A product owner is not only responsible for ensuring that the customer voice is correctly interpreted across the teams, but also for the final product quality. An integrated DevOps setup that allows the product owner to access right information in real time in the tool of their choice is the key to successful planning and execution of the product management plans.